Europe's White Christmas Proving Frightful The worst winter weather in decades continued to hold the Continent in its grip, freezing road and rail traffic and stranding thousands of outraged holiday travelers at Europe's major airports for a fourth day. In Britain, the government offered troops to help ease airport gridlock. 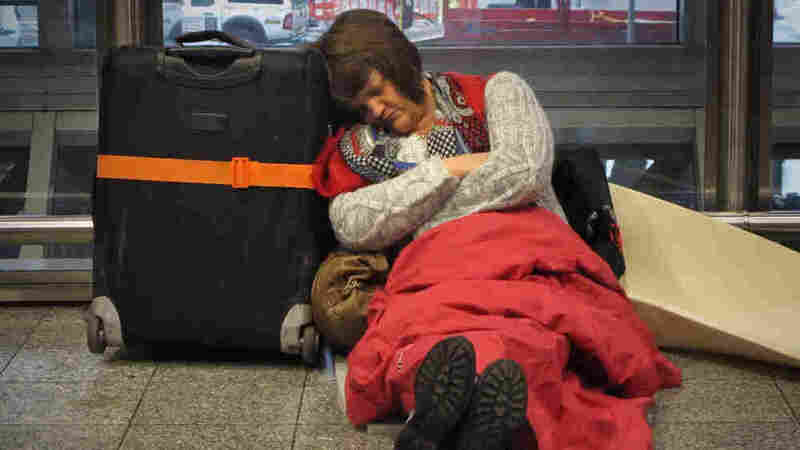 A passenger sleeps on the floor as she waits for a flight from Terminal 3 at Heathrow airport Tuesday in London. Thousands of outraged and exhausted holiday travelers crowded departure halls in Europe's major airports for a fourth day on Tuesday as the worst winter weather in decades continued to hold the Continent in its grip, freezing road and rail traffic. London's Heathrow, Germany's Frankfurt and France's Charles De Gaulle were among the airports turned into virtual dormitories after massive cancellations and delays due to the heavy snowfall and temperatures well below freezing. A snowblower clears snow from the airfield at Berlin's Schoenefeld airport. Germany's largest airport, in Frankfurt, has been forced to cancel hundreds of flights in recent days. British Prime Minister David Cameron said he offered troops to help clear delays at U.K. airports and told reporters that his government had offered military assistance to the company that operates Europe's busiest airport and others in Britain. At hardest-hit Heathrow, many passengers on Tuesday were warned they will not be able to travel before Christmas. The airports have told travelers to stay away unless they are certain of departure, but some people, hoping against the odds to get a flight, have showed up five days in a row. "There is some basic physics. If more passengers come to the terminals than leave, they get jam-packed," said Colin Matthews, who heads BAA, the company that manages Heathrow. Cameron promised that the second runway at Heathrow would reopen within hours. "Snowplows are on that second runway as I speak," he said. The Eurostar train link was also shut down, leaving thousands or people stranded across Europe as the Christmas holiday draws near. Some 72 hours after a 5-inch snowfall, the icy road conditions in much of Britain also raised doubts about the delivery of gifts because many side roads were hazardous. Many major businesses have stopped taking online orders for pre-Christmas delivery because of the poor road conditions. It's pathetic — you would think this is a Third World country. It's weather "you get in Siberia, not Britain," said NPR's London correspondent Philip Reeves. The British, he noted, "are woefully ill-prepared for this sort of thing." Reeves said he lives in the flight path of Heathrow and would normally hear dozens of planes flying over in the course of a day. "Today, and this has been true for the last few days, it's been totally silent," he said. Predicted snowfall at Heathrow did not materialize overnight, allowing cleanup crews to intensify their work, but more than half the flights at Europe's busiest international hub were expected to be canceled. "It's pathetic -- you would think this is a Third World country," said Janice Phillips, 29. She was trying to get back to Minneapolis along with her boyfriend, who was sleeping next to her with his head propped up on a backpack, mouth ajar. "I've been here for two weeks, and all they've been talking about was this snow forecast. You would think the government could do a better job." Other stuck travelers pointed out that the snow stopped on Saturday and yet the airport was still hobbled three days later. "It's not even snowing!" said Candie Sparks, 19, who was trying to get back to Santa Fe, N.M. "It's crazy." At Charles de Gaulle airport in Paris, the French army distributed hundreds of cots and thousands of blankets to stranded passengers for a second night. The national carrier, Air France, has come under fire for its handling of the crisis, as thousands of passengers complained of an information blackout over the past two days, complaints echoed by many stranded passengers in London. In Germany, fresh snowfall early Tuesday morning forced Frankfurt's airport, the country's largest, to suspend takeoffs and landings temporarily. Hundreds of flights have been canceled in recent days. 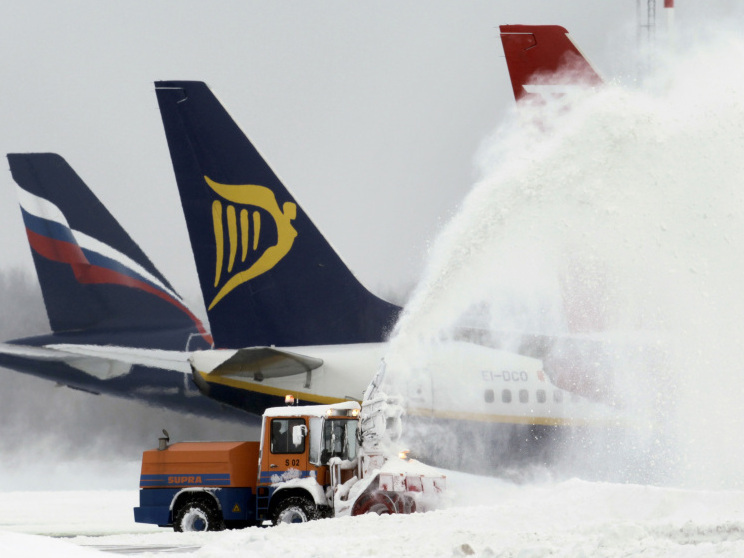 Britain's transportation commissioner, Siim Kallas, said new airport regulations due to be published before the summer could include new requirements on "minimal services" airports will have to be able to provide during severe weather. He said he will meet with airport representatives in coming days "to ask for further explanations and to take a hard look at what is necessary to make sure they would be able to operate more effectively." "Airports must get serious about planning for this kind of severe weather conditions," Kallas said. "We have seen in recent years that snow in Western Europe is not such an exceptional circumstance." Eurostar, which links England to France and Belgium by train, also advised passengers to cancel upcoming trips unless absolutely necessary in exchange for a full refund. Eurostar said trains were running with speed restrictions in both England and France as a precaution, because snow and ice stirred up by trains could damage the underside of the carriages. At least one high-speed train crawled along at just 12 miles per hour inside the Channel Tunnel. Rail expert Christian Wolmar said Eurostar was being cautious after last year's holiday-season breakdown, when powdery snow got sucked into the engines of speeding trains and the entire Eurostar service was suspended for three days. A report recommended running trains more slowly in snow. Wolmar said the real problem was bad management and that "Eurostar ought to be ashamed of themselves." Outside London's Eurostar terminal, the line of travelers waiting for trains snaked several hundred yards from the station, down the street and all the way to the British Library. Inside, puffy-eyed passengers shuffled across the cold concourse, watching anxiously as the line periodically spurted forward. One older man played Beethoven's "Ode to Joy" on his harmonica. The crowd livened up when he switched to Europe's "The Final Countdown." In Cologne, two railway workers were killed during the night when they were hit by a train as they tried to de-ice a switch. Police said the men apparently did not hear or heard too late a warning signal from the train driver, the German news agency DAPD reported. No one aboard the train was hurt. The heaviest snowfall in a quarter-century has also snarled much of Ireland, with drivers forced to abandon their cars even on major Dublin roads. Siobhan Moore, spokeswoman for Dublin Airport, says runways are open Tuesday but flights face major disruptions because of the difficulty of getting aircraft in and out of Britain following Monday's mass cancellations. Dublin was closed for several hours Monday, while several intercontinental flights bound for Heathrow were diverted to Shannon in southwest Ireland, where passengers from the United States, Canada, Nigeria and Japan were accommodated in local hotels.